The next innovation in health care may come from Silicon Valley. With Google, Apple and Samsung exploring how to incorporate health IT features into wearable devices, patients may soon provide information to doctors through devices such as smartwatches that can measure and transmit biometric data. Health IT wearables will open a digital conduit so that, for instance, doctors can more readily monitor patients with chronic conditions while also cutting down the need for office visits. “What’s going to accelerate health as much as anything is consumer devices having [medical] features on them so that we’re continuously collecting this data over a large population of patients,” said Dr. Leslie Saxon, a cardiologist at the University of Southern California Keck School of Medicine and executive director and founder of the USC Center for Body Computing. 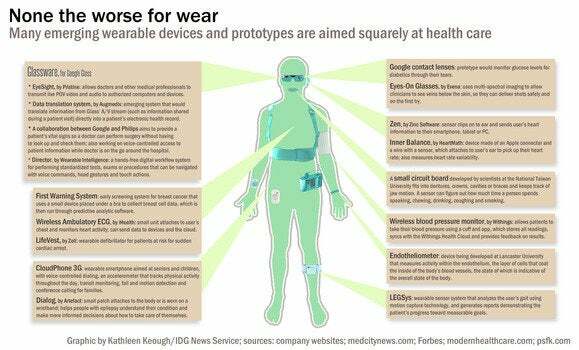 While none of these companies has health IT wearables generally available, each has shown interest in the market. Apple executives met with the U.S. Food and Drug Administration in December to discuss mobile medical applications, according to the agency’s public calendar. The company is rumored to be developing a smartwatch with health IT functions and has hired staff with backgrounds in medical sensor technology. The FDA’s calendar also noted that Google last year met with agency representatives including the adviser on mobile medical applications and staff who regulate ocular and cardiovascular devices. Additionally, Google developed and is testing a prototype contact lens that can help diabetics monitor their blood sugar by measuring glucose levels in tears. Samsung and the University of California, San Francisco, recently established a lab on the school’s campus to test and validate medical sensors and digital health technologies. “We are now seeing a transition to companies thinking about these [devices] in a much more rigorous way, that they are going to be used for maintaining wellness or treating disease,” said Dr. Michael Blum, the associate vice chancellor of informatics at the UCSF School of Medicine and the director of the school’s Center for Digital Health Innovation. The first generation of wearable devices from companies like Fitbit and Jawbone collect information that people would find interesting, like the number of steps walked, but have somewhat limited use from a health perspective, said Blum, who is a cardiologist. “They were based on very little science,” Blum said. “They were really based on how can we build a device and make it a marketing success.” These devices and the technology they use were never validated for accuracy and the metrics they measured were never scientifically proven to have wellness benefits, Blum noted. For wearable devices to be accepted by physicians, they need to be “designed with the kind of 99-plus percent precision” that is expected from their clinical counterparts, Blum said. Without validation of the devices’ ability to take accurate readings, patients and care providers can’t rely on them and “they end up in a drawer,” Blum said. But physicians would welcome a new generation of scientifically valid wearables, since the high volume of data generated by such devices may lead to new ways of identifying disease symptoms, measuring wellness and discovering nontraditional vital signs, said Blum. Most people spend their time outside of hospitals and wearable devices will give doctors data on how lifestyle affects a person’s health, said Dr. Michael Docktor, a gastroenterologist at Boston Children’s Hospital. Given the huge installed base that the leading tech companies have, even limited use of wearables among their users could create useful data sets. As keen as some doctors are on wearable devices, however, the health care system isn’t ready to incorporate the technology. Care providers are focused on implementing and learning electronic-health-record (EHR) software, Blum said. When EHR systems are established, they’re designed around storing data generated from a patient visit, not information from a wearable device, he added. The data analysis component of health IT is still developing, said Blum. Don’t expect to upload wearable data to Google or Apple’s cloud for analysis, he said. “The vision is the doctor is sitting waiting for all this, and the doctors aren’t. They’re running around with their hair on fire trying to do what they do right now,” Blum said. Eventually, companies that specialize in handling high-volume data will partner with the medical community to better understand the health care ecosystem and offer analysis applications. Some physicians and software developers may opt to build applications for specific medical conditions that push relevant data to clinicians, Docktor of Boston Children’s Hospital said. “I think it’s going to be people independently hacking the system,” he said. Google, in particular, will “really make a compelling argument for hacking cool solutions for medical applications.” Docktor added that the company already followed this route by making an SDK (software development kit) available for its Glass headset. Meanwhile, every party involved in health IT realizes that data security “is critically important,” said Blum. The challenge is keeping data secure while preserving its “fluidity” so it can be added to larger databases and used to advance medicine. How, and if, IT companies have to comply with the Health Insurance Portability and Accountability Act (HIPAA), a U.S. government regulation that deals with health data security and privacy and how the information is exchanged, depends on what products they develop. To avoid having to develop HIPAA-compliant services, IT vendors may make people responsible for managing and sharing their data instead of developing a physician portal, Docktor said. In an economy that monetizes private data, companies that collect or handle biometric data could potentially sell it to third parties, said Saxon. This business model raises privacy concerns, even when data is stripped of details that link it to specific individuals, and people may deserve compensation for contributing their information to a database created from wearable device data, she said. Who gets the data? And for how much? “Even if they get some kind of service or device for free from Google, at the end of the day if that data is going to be sold should people be compensated? I don’t know the answer. But if somebody plans on making money from it then we should be thinking about it,” Saxon said. Of course, finding value in and safeguarding data won’t be a problem if people don’t start using wearable devices in the first place, or stop using them after a while. To get people interested in using health-oriented wearables, the devices need to offer data that users can learn from, Saxon said. To do that, the data such devices collect could be integrated with features from other applications so that, for example, a wearable user could get content on what foods to eat to increase blood sugar if it got too low. Data and device consolidation could also boost the popularity of wearable devices, Saxon said. Instead of uploading data from five sensors to different clouds, people could use one application or device that stores their information in one place. Ultimately, people want well-designed, reliable consumer products that fit into their lifestyles—areas that Apple, Samsung and Google specialize in, Blum said. “Who anticipates Apple developing something that is ugly that no one wants to wear?” Blum said. The major tech companies have an opportunity to make a big impact on medicine, because if health IT wearable devices really take off, health care won’t function the same way.